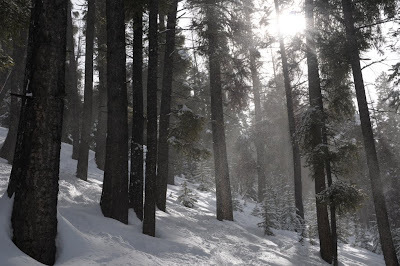 A surprise six inches of powder greeted us when we awoke in Sun Valley, so we headed for the hills. Avalanche risk was high, so Naomi, Brad, and I, accompanied by Hannes, headed for the resort. Poor Hannes planned on doing a run or two with us before driving to Colorado for Spring Break. Little did he know, we didn’t plan on using the lifts. The main powder stashes were tracked out by midday, but the trees held onto the powder for the afternoon, which was when we got to them. Who knew one lap at the resort could get you so tired? Like all good ski days, this one ended at the hot tub. 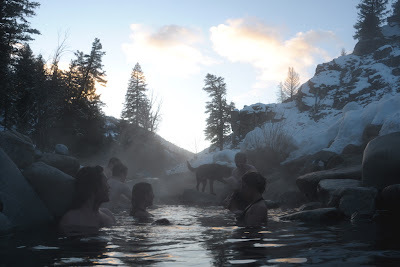 But leave it to Idaho to have natural hot springs a short drive from the slopes. Some friendly neighbors had created a perfectly crafted pool within the river, complete with temperature controls (how much cold water is allowed to enter the hot spring area from the river). Be careful though, those springs can heat the place up in a hurry! 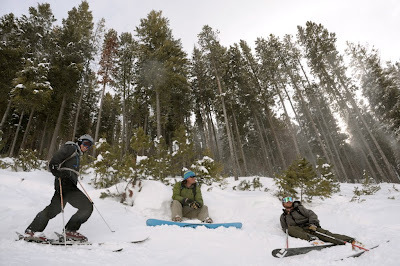 Upskiing Bald Mountain at Sun Valley, Idaho from Bernard Rocca on Vimeo. If you think we’re crazy, you may be right. But know this, we are not alone in our upskiing pursuits. Most resorts in North America either have no public stance on skiing up the resort terrain or have a policy that restricts it in some manner. Not surprisingly, it is often a point of heated debate, especially when ski resorts are on National Forest land. Sun Valley is among the resorts with no published policy and skiers regularly take to the slopes before, during, and after normal operating hours. We certainly received a few jeers, but they were far outnumbered by the cheers.